MOSCOW, March 17. /ITAR-TASS/. By the yearend, the Russian aviation base, which is permanently located at Belarus’s Baranovichi aerodrome, will accommodate a fighter air regiment of 24 Su-27SM3. The fighters will be used for air defense and to provide inviolability of the air space of the Union State of Russia and Belarus, Russia’s Air Force Commander Lieutenant General Viktor Bondarev said. “Right now in Belarus we have four Su-27SM3 jets that carry out tasks of the Union State of Russia and Belarus air force. 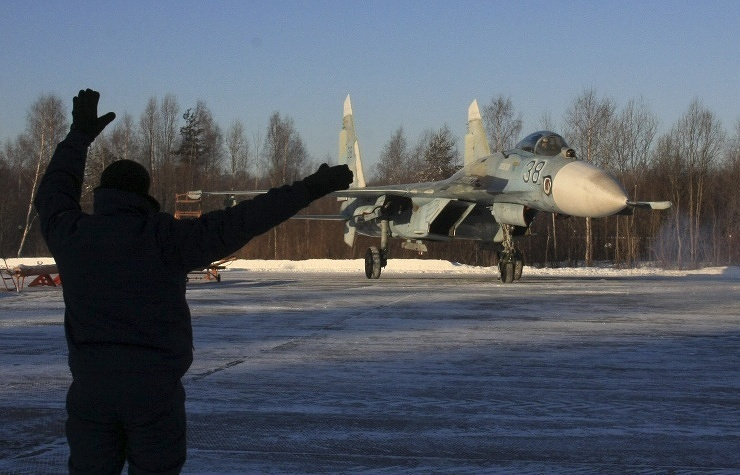 According to the plan for this year, we add a squadron there, and by the yearend at the Baranovichi aerodrome, where our air base is, we shall have a regiment of Su-27SM3 of two squadrons - the total of 24 fighters,” the commander said. March 15, press service of the Belarusian defense ministry said Russia’s A-50 (NATO reporting name "Mainstay") (a Soviet-built airborne early warning (AEW) aircraft based on the Ilyushin Il-76 transport) would go to the Baranovichi aerodrome (in Belarus’s Brest region) to participate in the second stage of checking the Belarus-Russia united regional air defense system. The Belarusian military said the technical features of A-50 “expand dramatically the opportunities for radar exploration, guidance for Belarusian and Russian fighters, as well as for managing the air defense forces on duty.